Google just announced plans to transition its ad exchange (AdX) and industry-leading ad server (Ad Manager/DFP) to a first-price auction. Prior to this announcement, Google carried the torch inside of the advertising ecosystem for standardizing the practice of a second-price auction. This was a practice Google believed provided a clearer reflection of the true price of a publisher’s inventory. A move to a Google first-price auction highlights how this type of practice was being taken advantage of by outside strategies and technologies in the space. This change will likely affect most digital publishers in some form or fashion. It will shift the day-to-day strategies of many ad operations professionals and alter the value that various publishing partnerships and technologies provide (both improving the value of some and greatly decreasing the value of others). Below, I’ll walk through what a shift to a Google first-price auction means for publisher ad rates, what publishers should be doing about this change, and what risks might be associated with Google’s big change to AdX. A first-price auction is when all advertisers bidding on a publisher’s inventory equally compete by submitting bids for a publisher’s ad space. The top bidder for the inventory then pays the winning bid price. This seems like the fairest way to force advertisers to compete. However, over the course of time, Google learned that this methodology didn’t actually produce a true price for a publishers inventory and often saw advertisers bidding far more than market value. In an effort to improve this for everyone in the ecosystem, Google adopted a second-price auction for their ad exchange. What is a second-price auction? A second-price auction is when advertisers all bid on a publisher’s inventory but the winner pays $0.01 more than the second highest bid. It has been suggested that this provides a better overall reflection of the market value of a particular publisher’s ad space. The way Google enacted this practice was by AdX having their second-price auction compete on a page that often included bids from other demand sources that adhered to first-price auction rules. This meant that Google would allow other parties to bid on a publisher’s inventory, but then they would submit the winning second-price auction bid from Ad Exchange. This often resulted in an unfair playing field. Often, AdX advertisers were the same advertisers that were bidding inside of the other competing ad demand providers. This meant that the same advertisers could be submitting bids in two different types of auctions on the exact same page. Will Google stop using a second-price auction now? Yes. It will be rolled out slowly but will likely be phased out over the next few months. Essentially, Google is seeking to make sure the playing field is fair for all advertisers regardless of what exchange or platform they are using to buy a publisher’s inventory from. Then how will it work now? Google will no longer adhere to second-price auction practices when selecting the winning bid from Ad Exchange. This means the AdX bid winner will pay the winning bid if they are the highest bidder on a publisher’s page. Why did Google decide to switch to a first-price auction now? While Google adamantly believed that the implementing a second-price auction across all of their publishing resources provided a more accurate price for ad inventory, they also realized that this practice was being taken advantage of by emerging practices inside the digital ad space. Header bidders, other ad exchanges, and yield optimizing solutions would adhere to first-price auctions and basically set the floor for the price of a publisher’s inventory. Then, Google’s AdX would submit the winning bid from its second-price auction. This meant that Google’s second-price auction winning bid price was competing against the first-price winning bid price which basically set the floor for a winning bid. If Google’s second-price auction winner wasn’t higher than that floor, Google would lose that auction for the publisher’s inventory. While Google is well-known for being one of the most dominant parties in the space, this unlevel playing field made it so that Google would often lose auctions when in-fact they had advertisers willing to pay a higher price for the ad inventory. The only reason they lost out on the auction was that the highest bidder was actually paying only $0.01 more than their second highest bidder. How will the change to a Google first-price auction impact publishers? Will the Google first-price auction reduce the value of header bidding partners and other ad exchanges? Yes. No longer will adding as many header bidding partners as possible offer real measurable value to publishers. Header bidding will still offer some value but it will be in the context of finding a small number of reliable partners with unique demand. Google’s Ad Exchange will win an even greater amount of the time than they do already. Does that mean header bidding and yield optimization is going away? Not necessarily, but it will change dramatically. Google’s Ad Exchange was winning a gross amount of the bids before this change and now they will be even more dominant. Prior to the switch to a Google first-price auction, certain header bidding partners may win a very small amount of bids by a very small margin. It was truly a small value before, but now it will be even less. This means focusing on adding lots of them will likely be a waste of time. Maximizing the number of demand sources will become a thing of the past. Those in ad ops will likely spend more time trying to find a small number of quality partners with unique demand that can offer incremental value when competing against Google. Does this mean publishers will make more money? It depends. For some, yes. For others, probably not. While a first-price auction under the current way advertisers are used to bidding could essentially lift overall ad rates for publishers, advertisers will quickly begin adjusting their bids to better align with the changes Google is making. This means more variance among the different prices publishers are paid by advertisers. Where an advertiser might have previously bid a $5.00 CPM for a publisher’s ad space and won, they will now need to lower that bid or they’ll risk spending a lot more than they were previously. That’s because they never actually paid that $5.00 CPM before. They paid $0.01 more than whoever bid the second highest for any particular publishers inventory. So which publishers will benefit from Google’s change? Since advertisers will likely lower their bids overall to adapt to a first-price auction, they will need to have a more granular understanding of which publishers offer them the most value. This means publishers with the most valuable inventory will likely benefit the most from this change. This will increase the amount of attention all publishers should be paying to overall audience engagement and how advertisers are viewing their inventory (we’ve highlighted how to improve this before). While some of this will be done manually by the advertisers, the rest of it will be automated by products like Google’s Ad Exchange or DBM. In the same way that we see things like visitor engagement drive improved ad inventory prices today, this will likely exacerbate the importance of these types of metrics for publishers as advertisers seek to differentiate between the publishers they are bidding on. What should publishers do about the change to a first-price auction? For a lot of publishers, nothing will need to change immediately. Truly, the value of a publisher to an advertiser is the value of the audience they are reaching. If the visitors to your website are engaged by your content and not impacted negatively by the ads themselves, your inventory will become more valuable to advertisers. 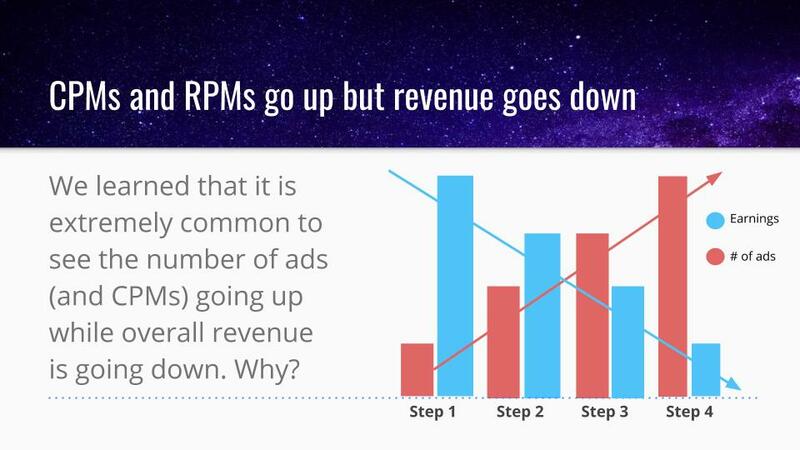 This is why we’ve shown that reducing the number of ads can have a net positive effect on ad rates and overall revenue. More and more publishers will likely focus on efforts like these moving forward. Since the announcement, we’ve seen a large uptick in the number of publishers requesting access to Ad Tester for this reason alone. As we discussed before, the value of adding lots of demand partners is going away. For this reason, spending lots of time managing these partners, getting them to pay you, and ultimately extracting value from them overall is not going to be beneficial. This also means that partners that specialize in header bidding and yield optimization will become more of a liability to publishers than a valuable addition. While the value of header bidding and yield optimization will be lower overall, the value that many of these shops and providers added were in the form of seeking out additional partners and managing the payments and time-consuming relationships. Now, that value is likely to deteriorate. This means that many of these 3rd party relationships are likely to cost more than the value they provide! For this reason, publishers should be wary about signing contracts with any of these types of partners. Their ability to help put greater auction pressure on a page is going to go away as Google makes this transition. In many cases, it is probable that these relationships could end up costing publishers more money than they earn form them. I use Ezoic, will this affect me? The answer is basically, no. I say that because it doesn’t mean you can ignore this if you’re an Ezoic publisher. In fact, the value of Ezoic to publishers is probably improved by this change. This change actually benefits our technology and our platform because it makes ad demand a greater commodity than it was before. This means that the value of using machines to improve the value of a publisher’s inventory and to change ad density and ad placements on a per visitor basis has more value than ever before — as the demand sources become less important in the overall equation. This change could affect your EPMV over time (positively or negatively) but that won’t have anything to do with Ezoic and will be based on how advertisers are adjusting to these changes and view your site (see above). If visitors visit more pages because our machines learned which ad placements cause different types of visitors to bounce more or spend less time on site, we believe this will be something that more and more advertisers will begin to observe and bid higher prices for. That being said, publishers as a whole do need to be thinking about things like visitor engagement time and navigation bounces. These metrics provide a more granular look at authentic visitor engagement and offer long-term benefits given these recent changes. Using Big Data Analytics could offer some really powerful data in this process. When will this happen and what do we do next? Google is going to start rolling this out slowly. They will start with smaller portions of web traffic and incrementally increase it in the coming months. It is a good time to keep an eye on all demand sources you’re utilizing. This change could close the doors of lots of various ad demand businesses. This space is notorious for having partners close their doors while still owing publishers money. To protect yourself, try to minimize the number of demand sources you work with and avoid long-term payment contracts with header bidding shops. Google will likely finish this rollout by the end of 2019 but it is anyone’s guess on how quickly it moves before then. Additionally, Google will likely have changes and modifications to some of how it will all operate as they go. If you have additional questions about Google’s switch to a first-price auction and how it might affect you, leave your comments below. I’m happy to answer them to the best of my ability. Outstanding article Tyler. As an Ezoic Premium member I really believe in the Ezoic technology and ability to innovate. Things have really changed a lot since 20 years ago when I started Total Motorcycle, back then, just having a basic ad show on a page was advanced! haha. You’re right, Mike. I am actually just finishing up a presentation highlighting how digital publishing has changed in the last 10 years. More complex, more opportunity, more uncertainty. Since I know that I will never have the time or inclination to learn all the ins and outs as you have, I have to rely solely upon trust when it comes to my ad revenue provider. First I had to be convinced that I needed you instead of just Adsense. Now that that is out of the way I have no need or desire to add more players to the mix, especially now that you suggest they might me far more trouble than they are worth. And please, keep working to maintain my level of trust in your own capabilities. Joined Ezoic with my technical related website Freaky Jolly a few months back, currently getting good response & hope to get better in the near future. Al the best! If you use Google Ads, they claim that it will not affect the way you buy display ad inventory. This change is for Google Ad Manager, AdX, and DBB on the buy-side. An outstanding article with very clear explanations. Tyler – really good article. Clear and concise. Hey Martin, I wasn’t suggesting that header bidding only adds 3% revenue. It was just simply for an example on the differences in how bidding can work. However, I do believe that header bidding will become something far less important now. Wow. That is sort of surprising to hear; especially if you have ever read some of my other blogs. I’d be happy to address anything, in particular, you think that is inherently unfair about the information. A lot of people within the space dislike this move from Google, but they are essentially the last one to move into the first-price auction. I’m not sure they can be faulted for that. This will mean more dominance from them. I believe they are hoping to move to provide ad buyers and sellers more transparency through the chain. With them winning more, they will be positioned to do so. This is their take on it.